We’re always on the lookout for new members, particularly in the male sections. 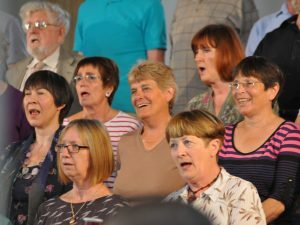 If you enjoy singing, why not come along to a rehearsal? 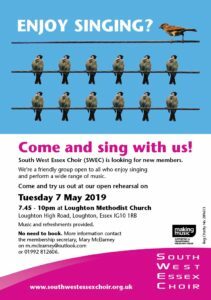 You are welcome to join us at any time and our next open rehearsal will be on Tuesday 7 May 2019. We practise in a friendly and supportive atmosphere and aim to develop individual musicianship, as well as present public performances to the highest achievable standards. If you wish to become a member of SWEC, there is no audition but you must be able to sing and we do ask that you commit to regular rehearsals and participate in the three season concerts. Rehearsals take place on Tuesdays from 7.45 -10pm at Loughton Methodist Church, High Road, Loughton, Essex, IG10 1RB. The church is within a 10 minute walk of Loughton Underground Station on the Central Line and on bus routes 20 and 167.